One of the biggest problems circulating the Internet has always been the chance of identity theft. While you may think that most hackers are only after your banking information, (which is pretty true), personal data such as your phone number, legal full name and home address are extremely valuable to them as well. They don't necessarily need to target you while you're doing your online banking. After all, online banking is quite secure these days and hackers will be less interested in attacking you when you're on your guard and suspicious of every little pop up or e-mail. So when else can they hit you? A hacker will want to strike when you're not thinking about security, a time when you'll be the least resistant to their attacks. Many hackers have learned that one of the best times to steal someone's personal information is when they're too busy having fun to notice; This makes online gaming the perfect ground for them to attempt an attack. So one day you open up the inbox of your e-mail and notice your favorite game developer is offering you something or telling you to reset your password. All e-mails, even legitimate ones, need to be screened by you thoroughly first before you give the sender any information whatsoever. Keep in mind that 99.9% of game companies will never ask you for any of your account information whether it be your username, password or even your Country of origin. This information is usually requested by the account holder and not the other way around. In the image below you can see a recent example of a World of Warcraft phishing scam (commonly known as keylogging) circulating the net right now. A well disguised inbox e-mail that appears to be legitimately from Blizzard. Scammers will commonly ask you to 'verify your password'. As you can see in the image above, the e-mail looks and sounds fairly legit. The hacker is also using an incentive, the chance of being included in the WOW Cataclysm beta as bait to get the user to enter in their information. 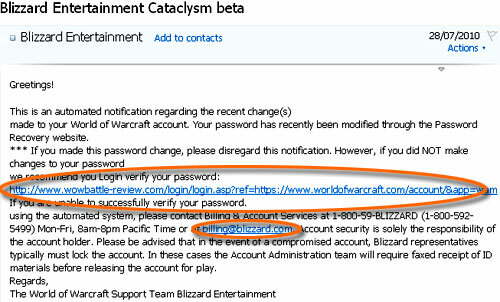 The link that is being requested to verify at, is clearly not a Blizzard owned site, yet to make the e-mail seem more legit, they have added a real 'billing@blizzard.com' e-mail address. In the next example of the same scam you will see an even better disguised e-mail used to keylog your login information. 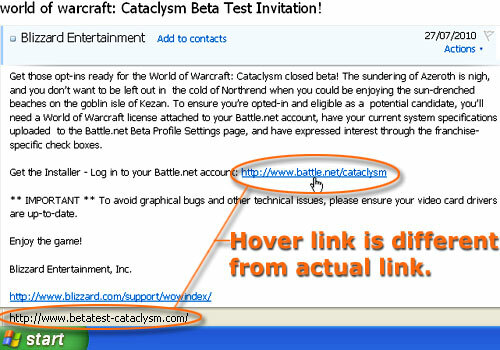 This link looks safe until the user hovers over it and finds that the actual link they are being sent to is a scam, www.betatest-cataclysm.com. Links that differ by hover should be an immediate red flag and avoided where possible. As you can see, the link is different than the link you hover over, where you'll actually be sent. The hacker tries to make the link as similar as possible by using the same words, "cataclysm" and "betatest" as incentive, to make the link feel even more legit to the unsuspecting user. If you clicked on the link, most likely you'll be taken to a page that looks nearly identical to an official Blizzard login page. You'll be asked to enter your username and password, and at which point you've given the hacker all he needs to steal your account. These keylogging, fake login pages tend to circulate forums frequently as well. The best way to know whether or not the page is legit is through your address bar in the top of your browser window. This is one place that hackers can't cloak or hide, the actual site you are residing on, unless they have already attacked your system directly and modified core browser files within your operating system. Lastly, Feel you know your stuff after reading this article? Take the test below to see if you are aware and hackproof.